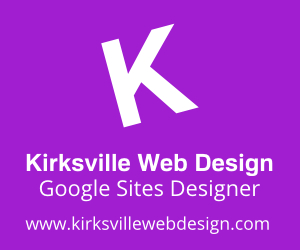 Imagine you had a Google Sites mapped to a custom domain, like www.kirksvillewebdesign.com. If you used Google Sites custom logo upload into the header, it would always link to your long sites.google.com/a/domainname.com/sitetitle URL. A total bummer! If you Google Sites is mapped and someone clicks on your header logo, you simply go back to the base custom domain URL! No more confusion about your Site's location. And this will help search engines be less confused now with the dread duplicate content. Google still supports Google Sites, albeit delayed.